Typo in your cover letter? Drunk message to your ex? At last, there's a way to "unsend" these emails. 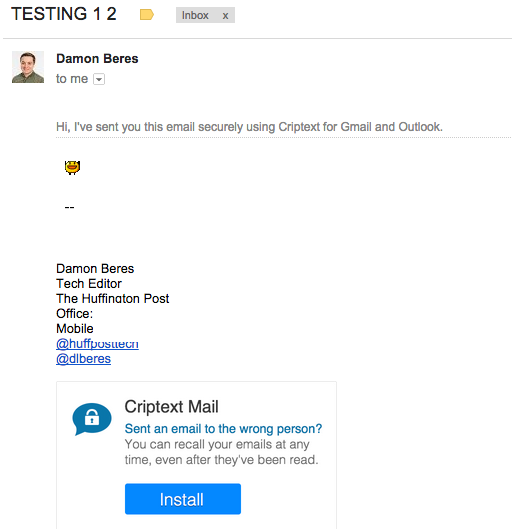 Criptext Mail, a new Chrome and Safari extension, offers a "recall" option that will prevent recipients from reading a message that you regret sending. It even lets you add an "expiration timer" to messages, which will automatically recall them after a certain time period. Gmail has long offered a "lab" feature that allows you to unsend an email, but only if you catch it within a few seconds. Criptext has no such limitation. That might sketch out the recipients of your email messages who don't understand you're using a third-party service. Mayer Mizrachi, CEO of Criptext, told The Huffington Post in an email that a "pro" version of the extension will eventually be offered that gets rid of the signature. In order to work, Criptext converts your messages to images and encrypts them. That prevents the messages from being scanned by bots, but it also makes them look a little weird and renders any animated elements completely static. Also, "recalling" the email doesn't totally remove it from a recipient's inbox. Rather, it removes the image version of the message in the email you sent. So, a recipient will still know that you sent them something, they just won't know what. It also raises the question of where Criptext stores the image version of the messages and how secure those messages are. Mizrachi told HuffPost that the content is essentially "streamed" from Criptext's own servers, so Gmail sends an empty email and the extension delivers the content within it. Criptext recently raised $500,000 in funding from investors and positions itself as a secure way for companies to send sensitive information, so presumably safety measures are in place to make sure their servers remain locked down. This story has been updated to include comment from Criptext.